If the graph shows an upward trend, say the exchange rate has moved from 1.27 to 1.29, we conclude the euro has appreciated or gained in value against the dollar. On the other hand, if there is a downward trend, the euro has depreciated versus the dollar over the time period measured by the EUR USD chart. – Line chart: Shows up as one continuous line and it reflects the closing price of the security over various times (for example each day) over the course of a range of time (for example three months). – Bar chart: A bar chart is plotted as a series of bars (vertical lines) that show the opening price, closing price as well as the high and low during each period over the defined range of time. Traders can employ charts over a range of time periods. For example, for short-term trades, they can use a chart that shows the fluctuation in 60-second increments of time. Alternatively, to gain perspective of longer-term trends, traders can review daily, weekly and even monthly charts. As traders become more sophisticated they get skilled at observing specific formations in charts, for example breaks in trend lines. These abilities then help them to identify trading opportunities to generate profits. But before doing that, it would be beneficial to look at different charts and simply get familiar with the different chart types and the various time periods for which charts are available. You can visit http://www.forexcharts.net/eurusd-chart.html to see the latest updates in the European and North American currency trade. What is Big Mac Index? 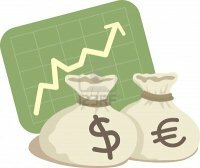 How to Profit From Euro Break-Up?